Cytokines and signaling pathways associated with the effector populations of cGVHD. (A) T effector cells respond to MHC/peptide on antigen presenting cells (APC) and, in the context of IL-6–, IL-23–, and IL-21–stimulated STAT3 phosphorylation, transcribe RORC to drive Th17 and Tc17 differentiation with secretion of IL-17 and related cytokines. IL-12 stimulation promotes T cell–specific T-box transcription factor (TBET) transcription and IFN secretion that signals in an autocrine fashion to enhance Th1 differentiation. Tbet expression and IFN-γ secretion are also characteristic of Th17/Tc17 cells after BMT. (B) Tregs respond to antigen within MHC class II and concurrent TGF-β and IL-2 signaling, which promotes STAT5 phosphorylation, SMAD signaling, and subsequent FOXP3 transcription. Immune regulation by secreted IL-10 and TGF-β ensues. (C) Tfh, identified by ICOS, CXCR5, and PD-1 expression, respond to antigen presented within MHC class II in the context of IL-6, IL-27, and IL-21 stimulation to drive STAT3 phosphorylation and BCL6 transcription, with subsequent secretion of IL-21. (D) BAFF and IL-21 drive GC B cell expansion and, in the context of B cell receptor signaling, subsequent SYK and BTK transcription promotes survival and allo- and autoantibody secretion. 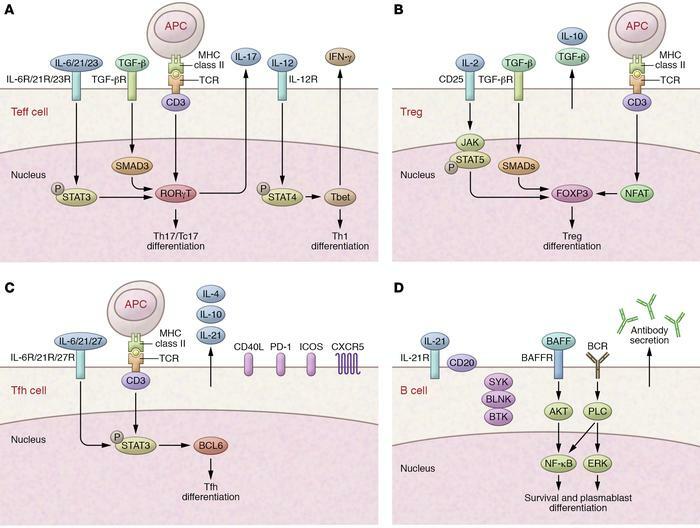 BLNK, B cell linker; NFAT, nuclear factor of activated T-cells; BCR, B cell receptor; PLC, phospholipase C.